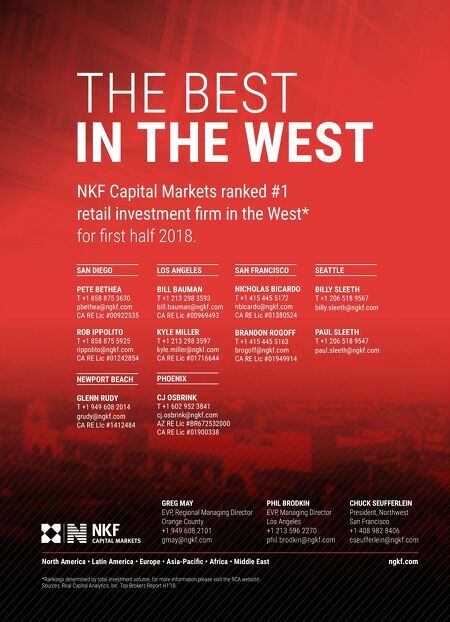 ngkf.com North America • Latin America • Europe • Asia-Pacific • Africa • Middle East PHIL BRODKIN EVP, Managing Director Los Angeles +1 213 596 2270 phil.brodkin@ngkf.com CHUCK SEUFFERLEIN President, Northwest San Francisco +1 408 982 8406 cseufferlein@ngkf.com GREG MAY EVP, Regional Managing Director Orange County +1 949 608 2101 gmay@ngkf.com *Rankings determined by total investment volume, for more information please visit the RCA website. Sources: Real Capital Analytics, Inc. Top Brokers Report H1'18. 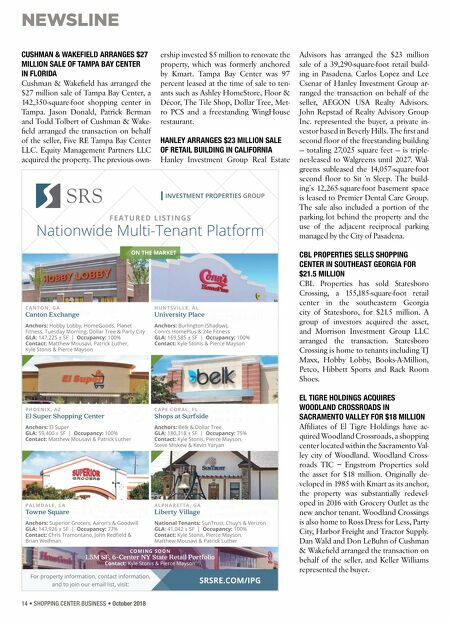 BILL BAUMAN T +1 213 298 3593 bill.bauman@ngkf.com CA RE Lic #00969493 LOS ANGELES KYLE MILLER T +1 213 298 3597 kyle.miller@ngkf.com CA RE Lic #01716644 PETE BETHEA T +1 858 875 3630 pbethea@ngkf.com CA RE Lic #00922535 SAN DIEGO NEWPORT BEACH ROB IPPOLITO T +1 858 875 5925 rippolito@ngkf.com CA RE Lic #01242854 GLENN RUDY T +1 949 608 2014 grudy@ngkf.com CA RE LIc #1412484 BILLY SLEETH T +1 206 518 9567 billy.sleeth@ngkf.com SEATTLE PHOENIX PAUL SLEETH T +1 206 518 9547 paul.sleeth@ngkf.com CJ OSBRINK T +1 602 952 3841 cj.osbrink@ngkf.com AZ RE Lic #BR672532000 CA RE Lic #01900338 SAN FRANCISCO NICHOLAS BICARDO T +1 415 445 5172 nbicardo@ngkf.com CA RE Lic #01380524 BRANDON ROGOFF T +1 415 445 5163 brogoff@ngkf.com CA RE Lic #01949914 THE BEST IN THE WEST NKF Capital Markets ranked #1 retail investment firm in the West* for first half 2018.